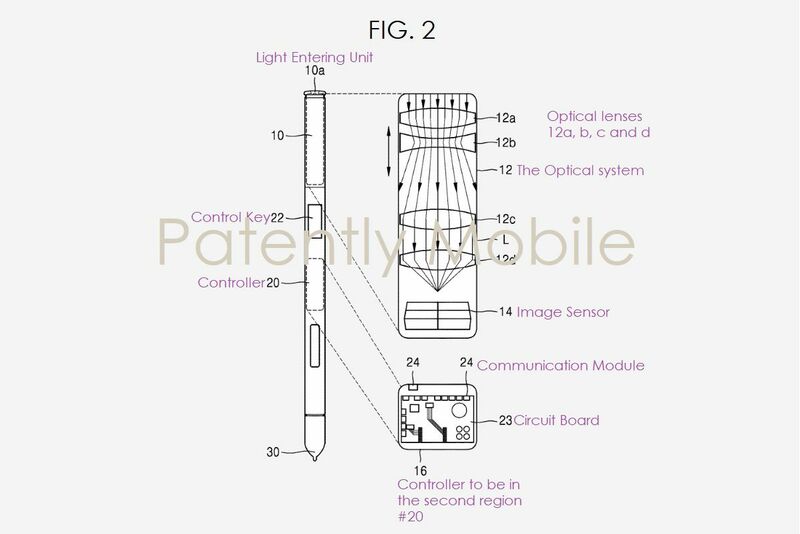 Samsung is considering building a camera with optical zoom into an upcoming stylus, according to a patent first spotted by Patently Mobile. According to the patent, which was filed in February 2017 and granted yesterday, the stylus would be able to wirelessly send any images back to the phone or tablet, potentially making use of the Bluetooth support that was added with the Note 9’s S Pen stylus. An S Pen with a built-in camera would offer a number of benefits. For one, space constraints in the main body of a phone normally mean an optical zoom is out of the question. But Samsung’s patent specifically mentions that the stylus’ camera includes an “optical zooming function.” Detaching the camera from the phone would also give you more flexibility with how you take your photographs — allowing you to take them from higher or lower vantage points while using the phone’s display as a viewfinder. The patent shows a stylus that contains a camera, and has its own control key. As with all patents like this, there’s no guarantee that this feature will ever make it to a future product. But after Samsung struggled with weak sales in 2018, it’s going to need eye-catching new features like this to revitalize its smartphone business. Samsung did not immediately respond to request for comment.